While one might not ordinarily consider death metal to be soulful music on the literal level, Decrepit Birth consider their music to be just that. "We call this music 'death metal from the soul,'" guitarist Matt Sotelo told Noisecreep. "It's the best way to explain our music. Because we write from the heart, it's pure and honest. "This music reflects our personal emotions. Even though it's not typical of death metal music, we see doing what we do as almost uplifting and spiritual. It's an emotional release from within. We hope people who check out our music can pick up on that." The band entered the studio last week to commence recording their third long-player, 'Polarity,' which is due out on Nuclear Blast later this year. "We are happy to say that the recording is going very smoothly so far. We are doing the drum tracking at Sharkbite Studios, which is the best studio Decrepit Birth has had the chance to work in. This will be important in bringing quality production for the new album. We really want every instrument to have their voice in this recording. With the help of engineer Zack Ohren, we are very confident that this will be our best sounding recording to date." 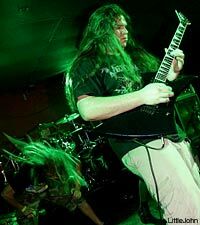 Soleto and Decrepit Birth hope that signing to Nuclear Blast will afford them a larger reach and audience as well. The band also plans to tour heavily in support of 'Polarity,' too. "Musically, the new material is a bit of an extension of what we did on 'Diminishing Between Worlds,'" Soleto said. "But we have added some new elements that bring a bit more of a catchy and memorable vibe to the music. "Also, every track is its own entity. We really tried to stay away from writing a bunch of songs that sound alike. We want the listener to be able to easily identify with the music. The new album will bring out dynamics that have been missing from our previous recordings. I think we have written an album that will really stick in your head."